Victory Gardens were a popular and patriotic way to aid the war effort during World War II.Â Millions of families across the country planted gardens to alleviate pressure on the domestic food supply during the war.Â Victory Gardens also boosted public morale because everyone felt civic pride through their contributions.Â In today’s difficult times, planting a garden makes more sense than ever.Â In the spirit of public service, we should consider them Victory Gardens, just like the ones our grandfathers and grandmothers had. Here are five good reasons we should all grow Victory Gardens. Fresh vegetables from the grocery store can be expensive.Â Growing your own vegetables is inexpensive!Â Seeds are cheap.Â Water is cheap.Â Time and sunshine are free. Enjoy a continuous harvest by staggering plantings of various veggies with different maturation rates.Â YouÂ are guaranteed that something will be available for consumption every day during the growing season. Your home-grown, fresh vegetables are chemical-free.Â Do you really want your children consuming pesticides and poisons designed to kill organisms?Â Growing your own vegetables is 100% organic. There is a trend afoot for organic farms and gardening that’s bigger than your backyard.Â Organic farms are being built into developments and subdivisions as an amenity, giving the local community access to fresh, healthy, and chemical-free produce. According to the EPA, 24% of our landfill waste is comprised of lawn clippings, leaves, and organic scraps from the kitchen.Â In other words, perfect compost materials account for a quarter of our garbage!Â This is a waste of our tax payer money.Â Fiscal conservatives and environmentalists alike can agree to save money, space, and resources by composting. 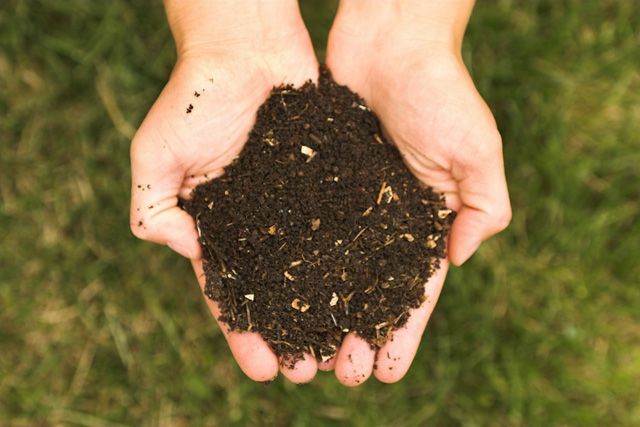 Making compost is easy and it’s great for your soil.Â It makes your garden vibrant and healthy, and the legacy you leave long after you move from that house is revitalized and regenerated soil.Â This is a Very Good Thing for our communities. Your fresh vegetables have a small or even negative carbon footprint. There is no truck carrying your produce across the country for consumption, so there is no pollution from your veggies.Â And considering that all green plants convert carbon dioxide into oxygen, your garden is cleaning the air. 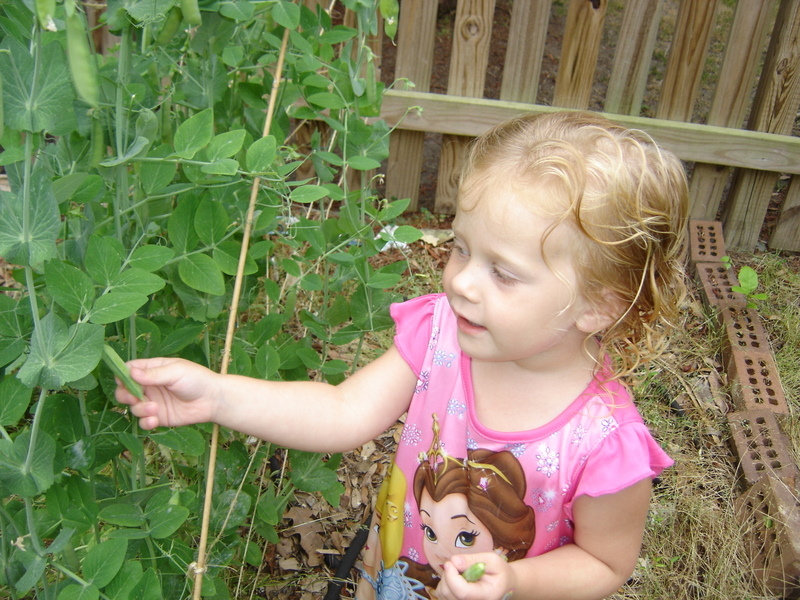 My daughter loves picking snowpeas with me when I get home from work.Â She loves playing in the dirt and planting seeds.Â It’s a great way to bond, but it’s also a valuable learning experience.Â She is seeing the results of her work while learning when and how to plant various crops.Â I know she’ll have great memories of working the garden with Daddy. More than bonding with my girls (the baby just likes playing in the dirt, but she’ll learn), gardening is also rewarding for me.Â I enjoy watching it come alive and grow.Â It’s a great reason to spend time outside enjoying the sunshine.Â It’s fun to get dirty while getting some exercise. I also know I’m doing a good thing for my family, my community, and our environment. I encourage everyone to grow a Victory Garden during this recession.Â Let’s show future generations that we’ve learned something from The Greatest Generation.Â We’ll all be better off, and so will our communities and environment. 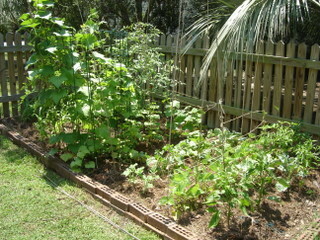 This entry was posted on July 3, 2009, 12:54 pm and is filed under Gardening. You can follow any responses to this entry through RSS 2.0. You can leave a response, or trackback from your own site.